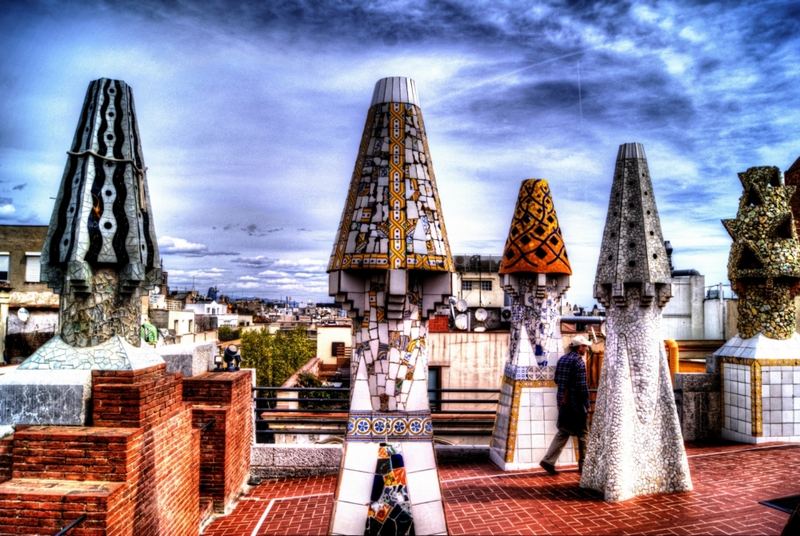 I was asked about the spires on the header of this blog. 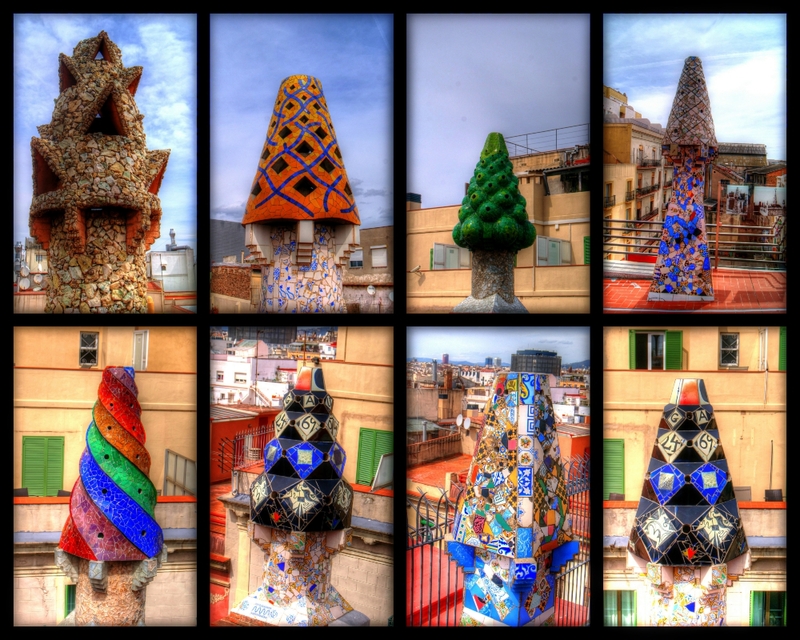 No, they are not part of a church, they are on the roof of a private house, the Palau Guell, or Guell Palace. 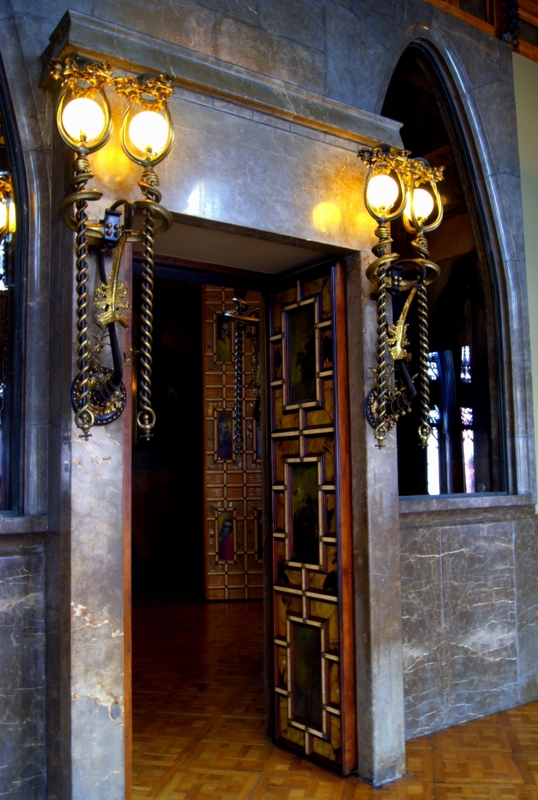 A private house with a difference, as it was built for Eusebi Guell by his good friend Antonio Gaudi. It gets a little lighter on the upper floors. 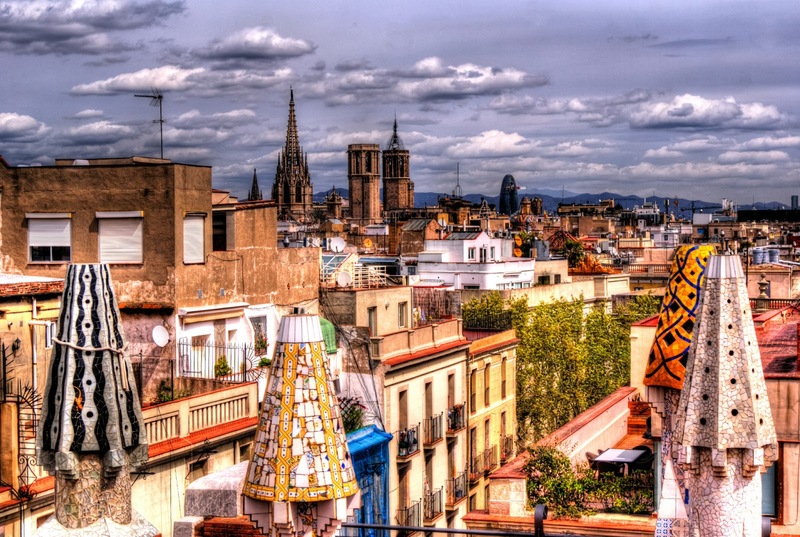 Many more of those spires on the roof, with a fantastic view over the old town. I’m away for the weekend, this is an automatic post. As my health is quite poor at the moment (gonna be fixed soon! ), haven’t been out for a photoshoot in ages. Therefore, thanks to the guy or girl who invented the notion of archives!!! 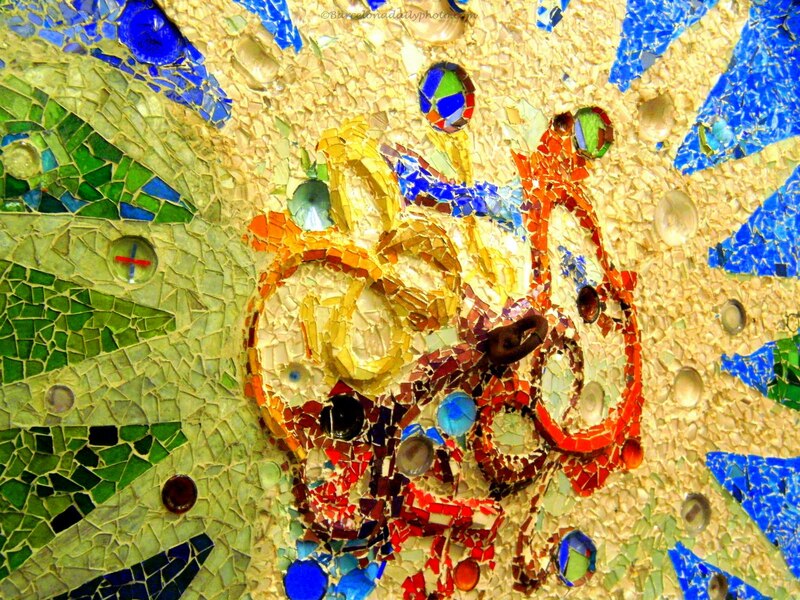 So… This is just another of Gaudi’s amazing mosaics, to be found in Parque Guell. It is raining, which means that we have our very own watery wednesday here in Barcelona. 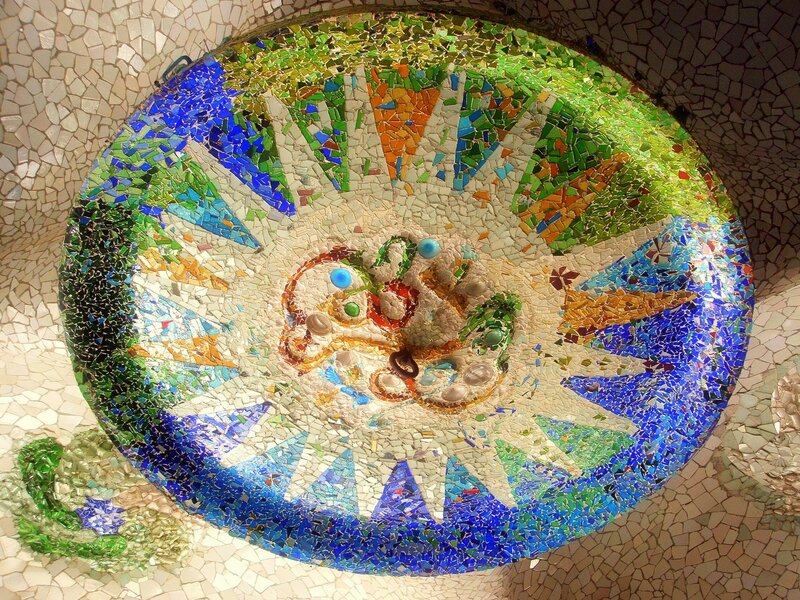 Photo taken in Parque Guell, A small fountain near the entrance, designed by Gaudi. 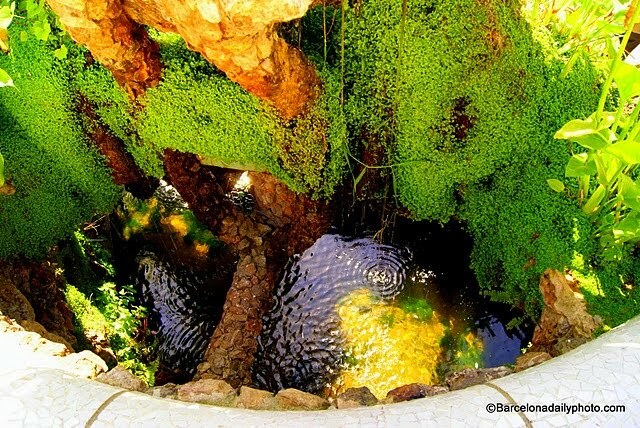 Please click here to see many more nice and watery photos! 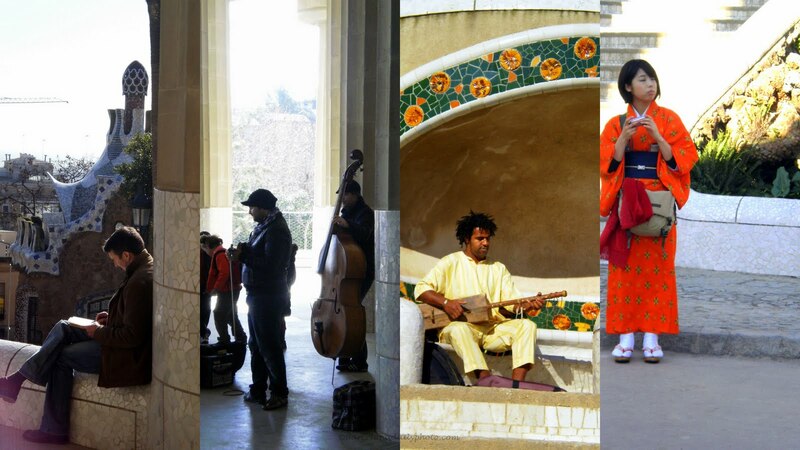 To finish the series dedicated to Parque Guell, here are some of the visitors and musicians. 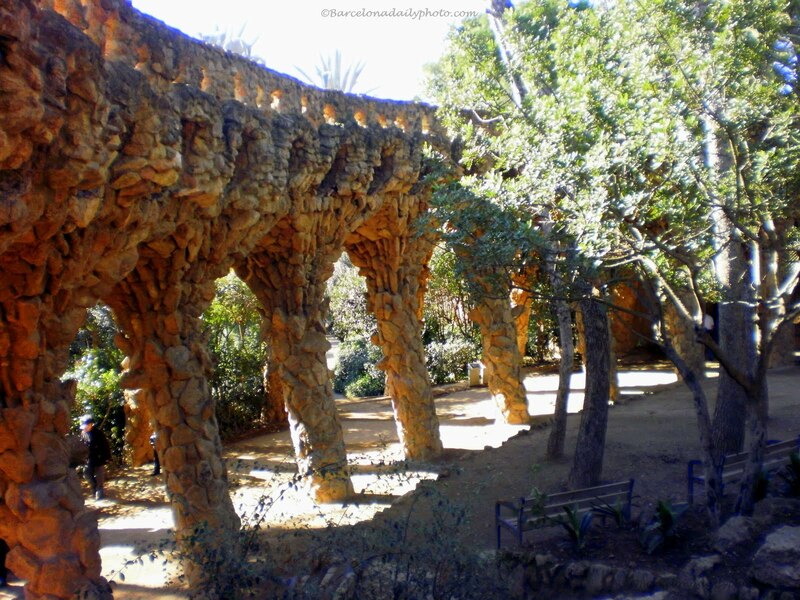 After some tiles, some wood, here are some stones, in the vivid imagination of Antonio Gaudi. 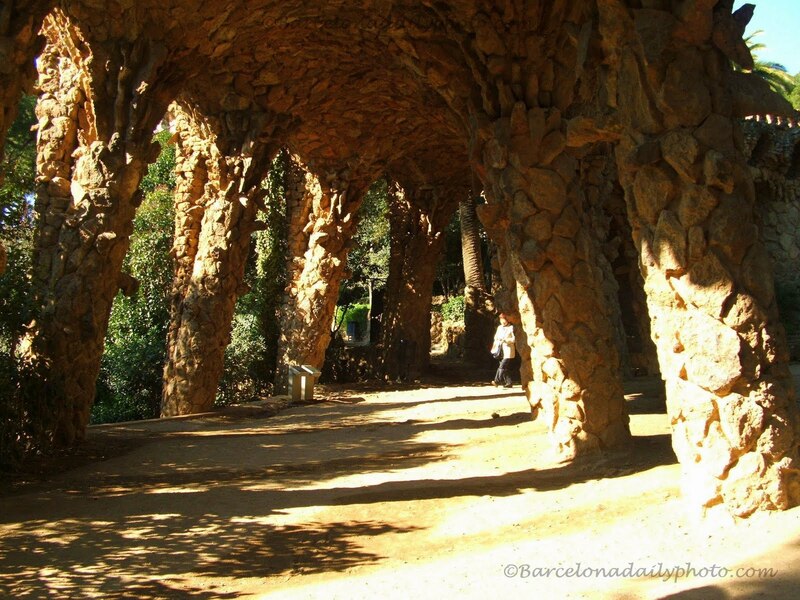 These are some of the walkways and corridors in the Parque Guell. And no, I wasn’t drunk with some discounted minnesotan wine when I took the first photo! 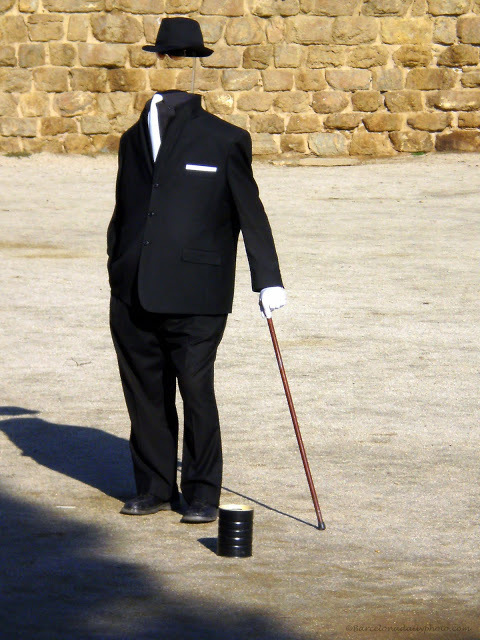 For the invisible man we posted yesterday, it must be quite easy during summer: I suppose he just takes his clothes off, puts on some suncream, and keeps the hat, supposing, of course, that he really is invisible. If he isn’t, no big problem: enough people roam the streets totally naked in the summer in Barcelona. Legally. Must be much more difficult for this Dragon Man, in his very fancy, and seemingly very hot costume. And a warm welcome to Regina from Kilauea, Hawaii, our 250th follower! Yes, we saw him, with our own eyes! 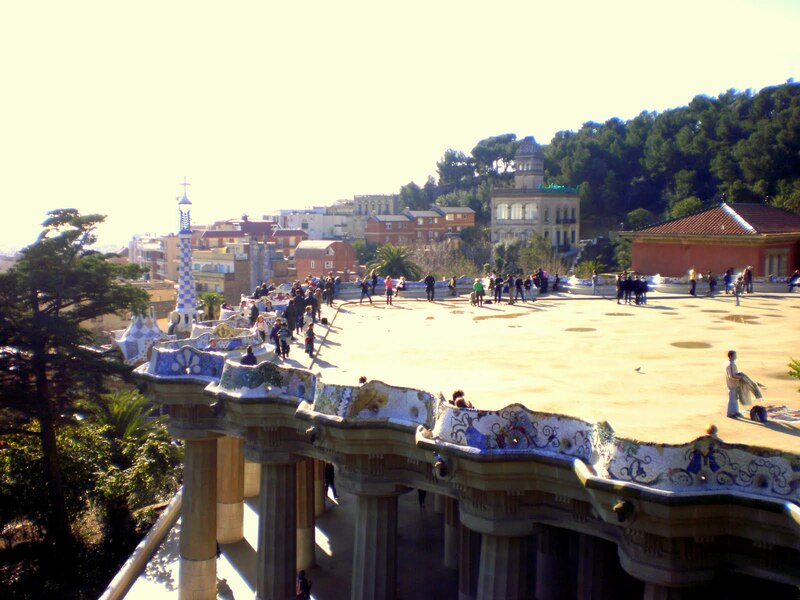 In the Parque Guell! 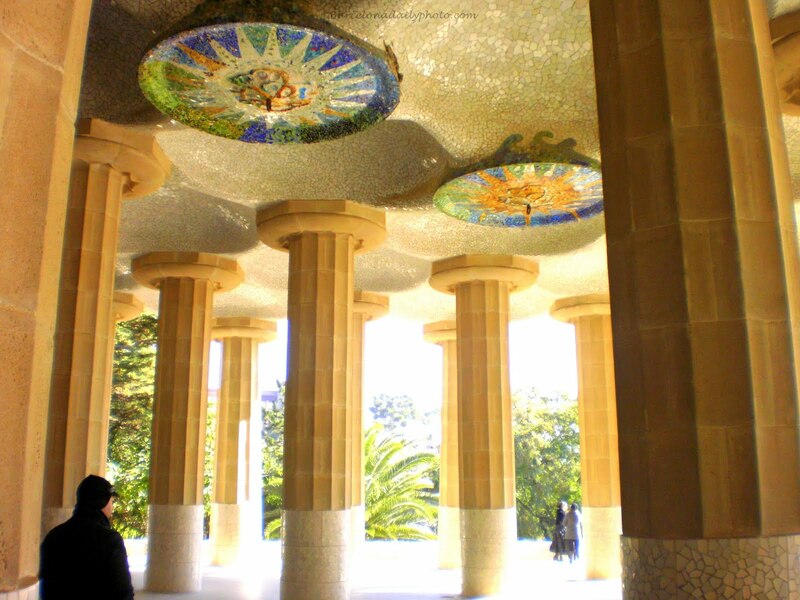 Underneath the Parque Guell’s main square, underneath the serpent bench, Gaudi built a very special kind of music room. 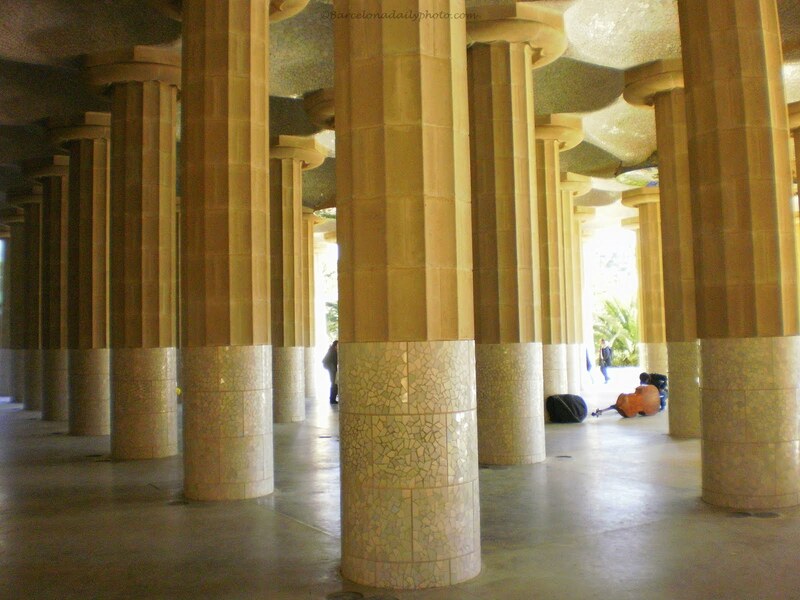 Supported by 86 doric columns, the vaulted ceiling reverberates the sounds, and it is a good place for buskers and other musicians. 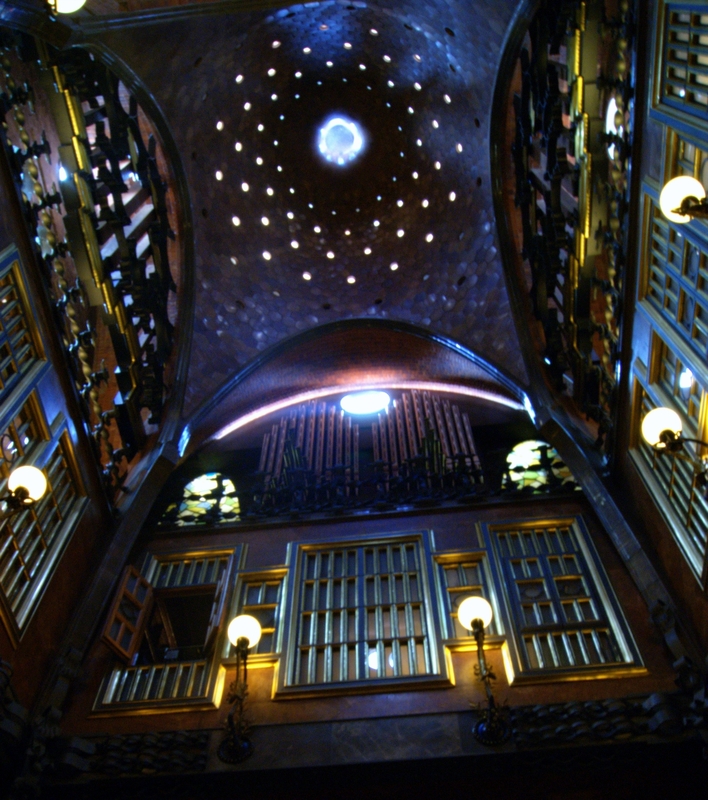 The 2 photos above show some of the decorations on the ceiling. 2 more views of the columns themselves. 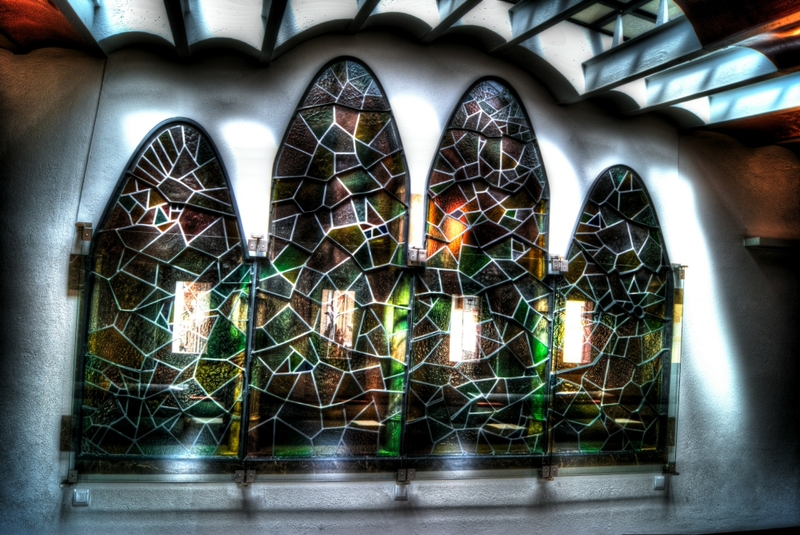 La salle de musique de la colonie Guell. 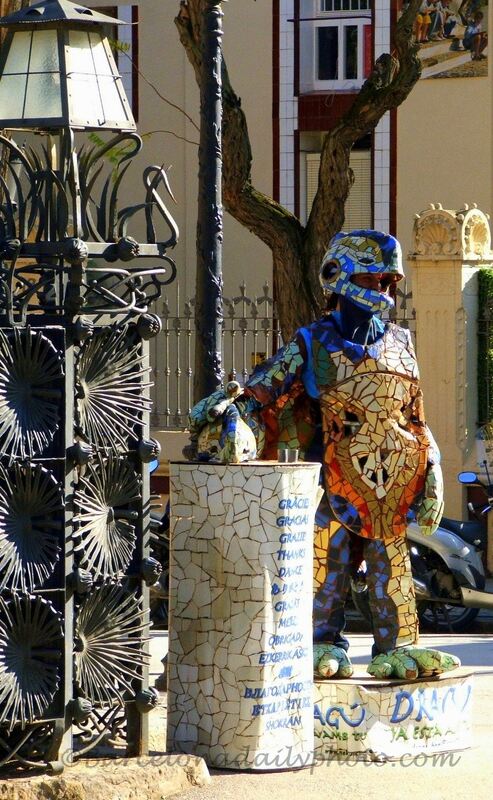 Gaudi avait une excellente comprehension des regles de l’accoustique. 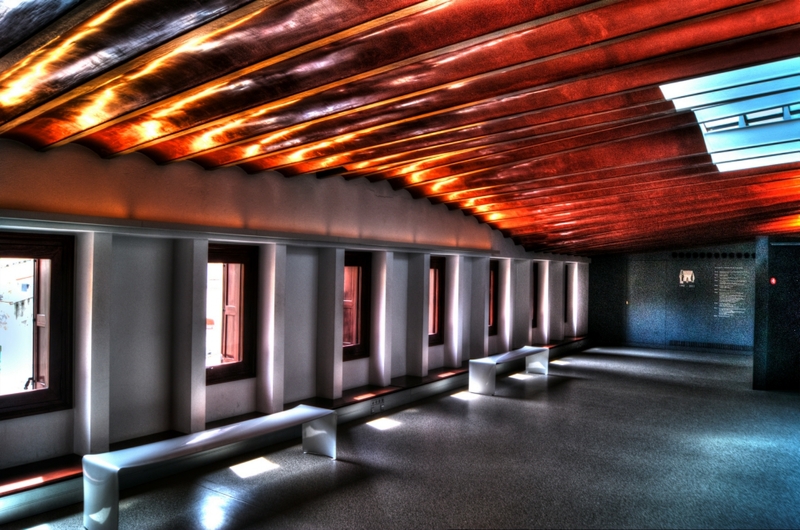 Le plafond alveole et les 86 colonnes doriques forment une tres bonne caisse de resonance. 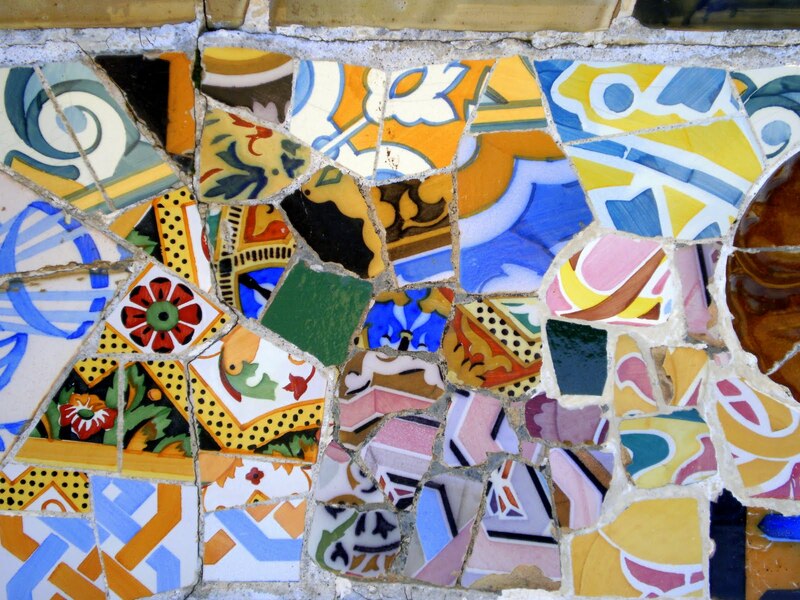 The Parque Guell, 17ha or 42 acres, was originally meant as a city. As every city, it has a main square, with a fantastic view over the city and the Med. And there is a public bench. Just one. Well, it is the longest in the world, 826 meters, half a mile. 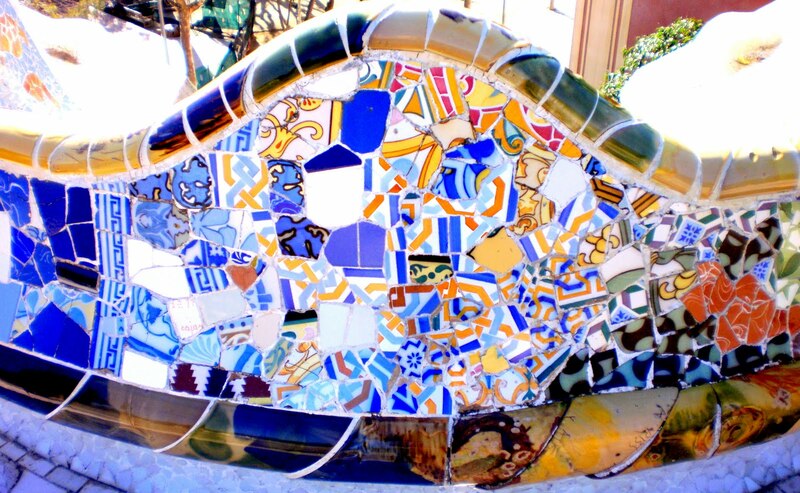 The bench is in the shape of a sea snake, and decorated with broken tiles, in a technique known as trencadis. Here is a view of a part of it. And some more detailled views of the tiles. 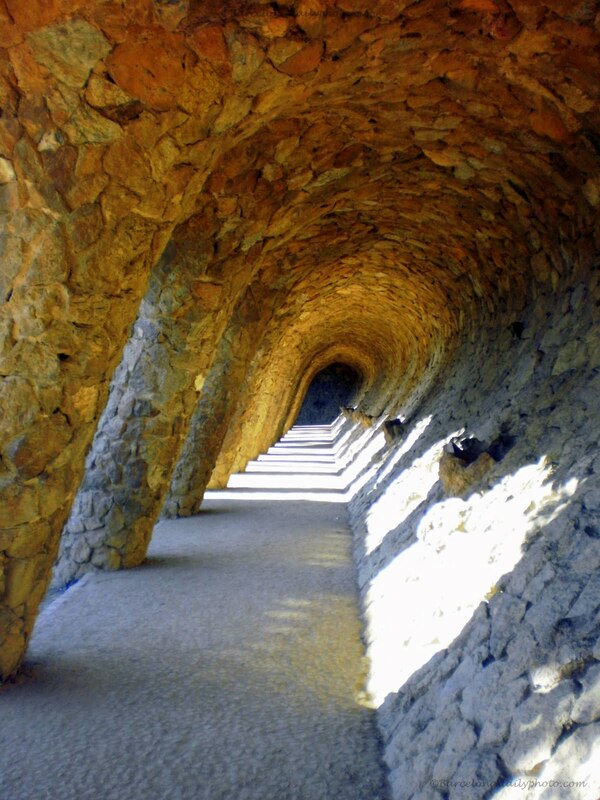 Quelque vues du banc de 826 m de long en forme de serpent de mer sur la grand place du parc Guell. 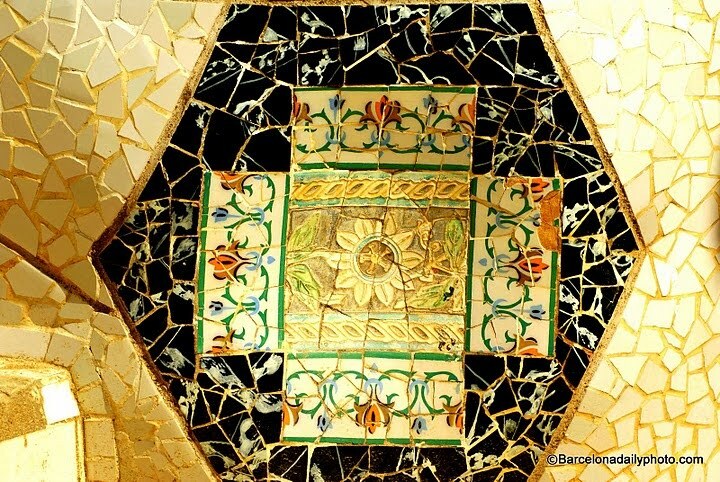 Entierement decore de bouts de mosaique casses, il s’agit d’une technique nommee trencadis. 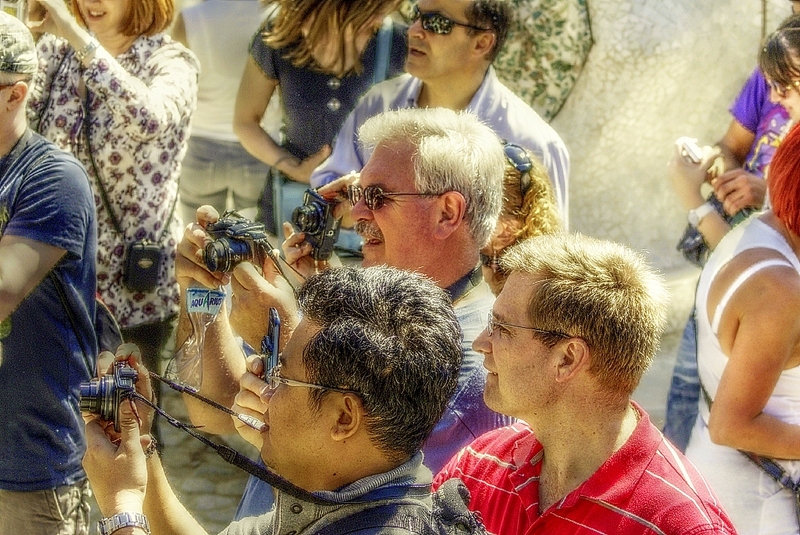 Another picture from Parque Guell. 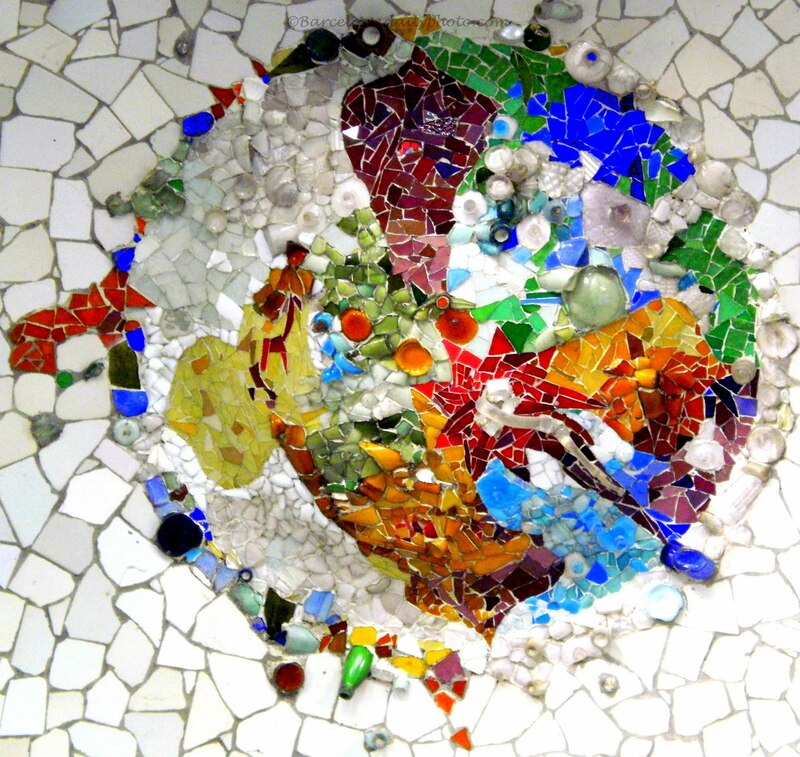 Gaudi made several of these round tile things, on ceilings. Quite amazing. 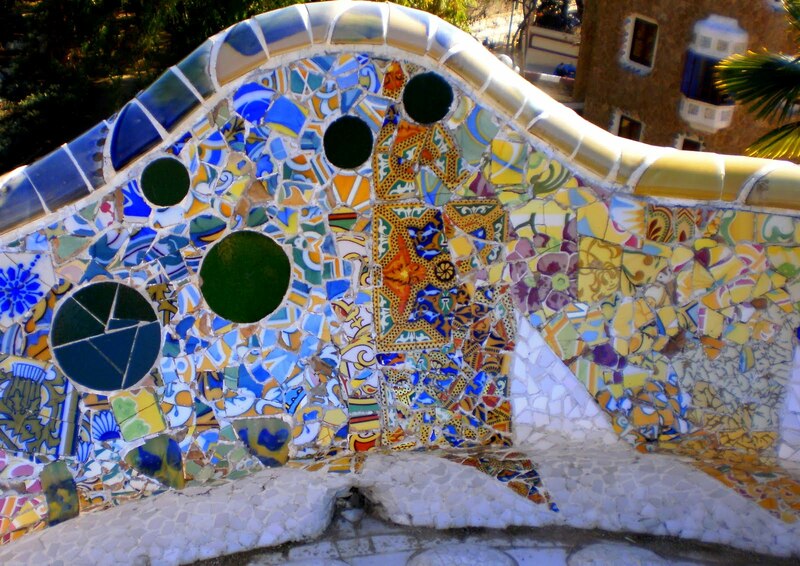 By the way, in Parque Guell, you will also find the longuest park bench in the world, over 800 meters, or half a mile, entirely covered with multicolored tiles, snaking it’s way through the park. I hope being able to post something about the bench soon. No, this is not a gingerbread house! 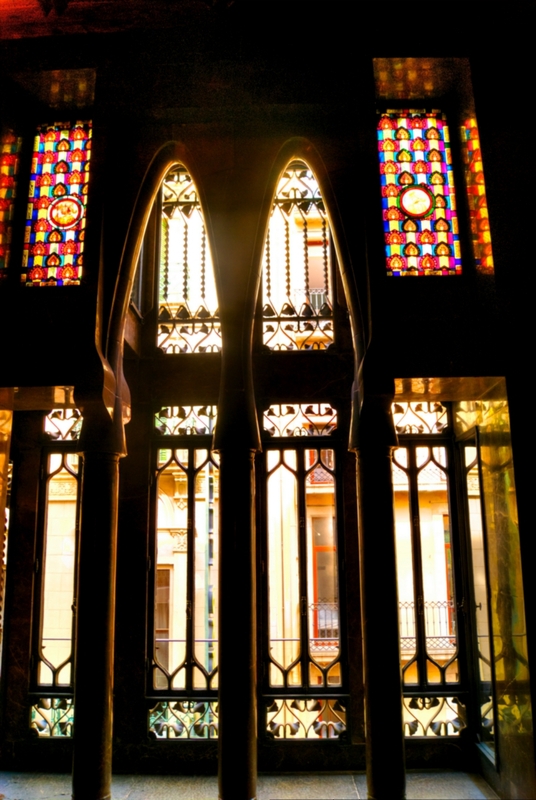 It is one of 2 buildings at the entrance to Parque Guell, one of Barcelona’s 8 World Heritage Sites. 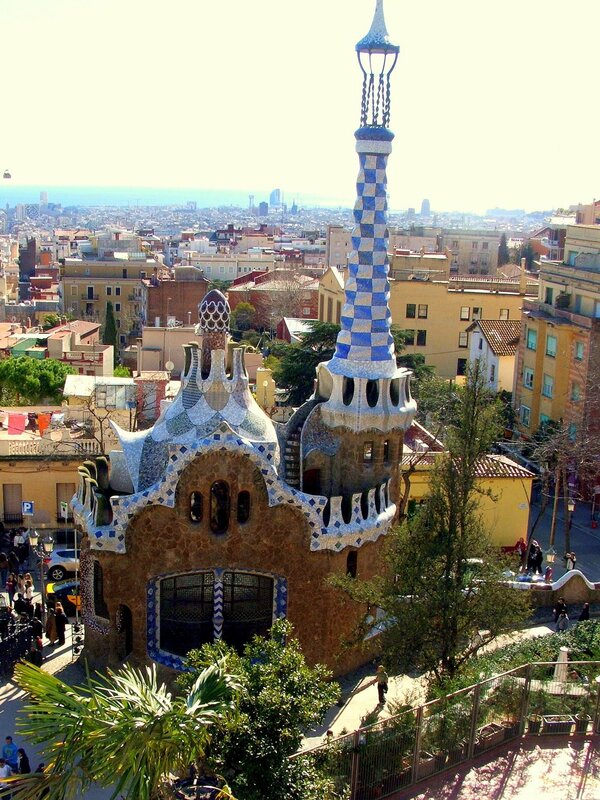 Designed and built from 1900 to 1914 by the Catalan architect Antonio Gaudi (of Sagrada Familia fame), and named after Gaudi’s friend, benefactor and sponsor Count Eusebi Guell, it was originally meant as a commercial housing estate… Would love to live in that kind of estate, Gaudi or Hundertwasser, doesn‘t matter! To know more about it, please check here. 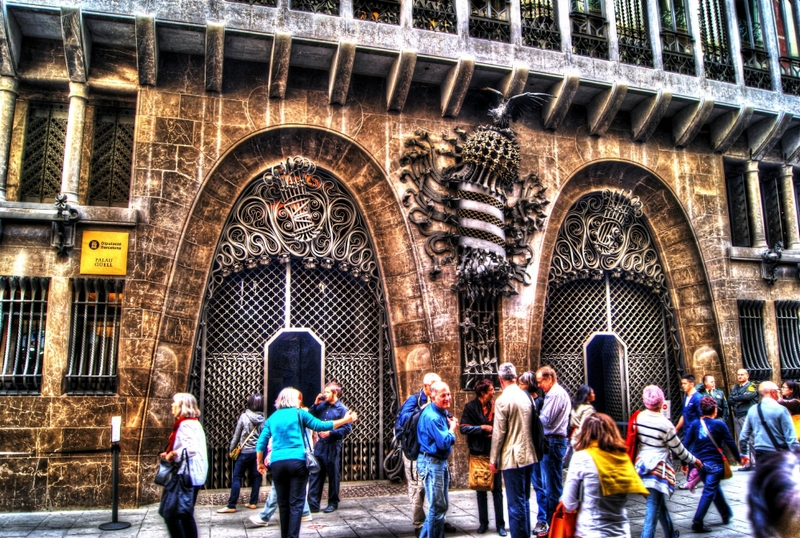 Nowadays, you can find the park‘s Gaudi souvenir shop in here, prosaically. Anyway, enjoy the view. And be aware that it is a hard climb, should you want to go there! And bring your own drinks, as the 2 or 3 bars in here will ruin you!